This is another hunt with a very high success rate that any age client can enjoy with limited experience level. Great for any hunter at any stage you will be able to enjoy all aspects of hunting techniques. Calling, glassing and the excitement of spot and stalk hunting in the mountains! We use 4×4 and quads to access our hunting areas. 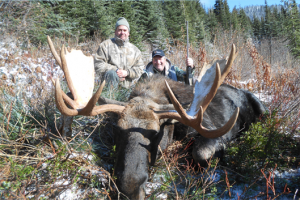 This hunt is conducted from our home/lodge as well as spike camps. This hunt can be paired up with a Mule deer or Whitetail Deer should you tag out early. With over 30 years of experience in this family owned business, get ready for the adventure of a lifetime. Elk, Bear, Mountain Goat, Shiras Moose, Mule Deer & White Tail Deer, Cougar and Bobcats. British Columbia is home to more species of big game wildlife then any where else in North America. PHONE (250) 225 3551 // EMAIL INFO@SHADOWMOUNTAINOUTFITTERS.CA // © 2016 SHADOW MOUNTAIN OUTFITTERS. ALL RIGHTS RESERVED.